Having your website across the web with a lot of competitors in your business is very risky. You always want your business to be on top or if not, at least be known by your target users. You will need to optimized your website well so it will be acknowledge by Google. However, it needs time and effort to achieve the goal. As a beginner, you need to follow these three tips. You should choose the best theme depending on the category of your website. Proper choose of theme would make visitors to go and look at your website. It is your website’s face to every viewers. If they see that it is beautiful, then search engine will index it and your post will increase traffic. Keyword is the most important element in SEO. You need to spread it out and use in a particular place. It is very useful when included in the title tags, meta description, tag line and content. Content is king and keywords must be put properly all over the content of your website. You can use main keywords or long tail keywords depending on its need. See how to find keywords for your content. 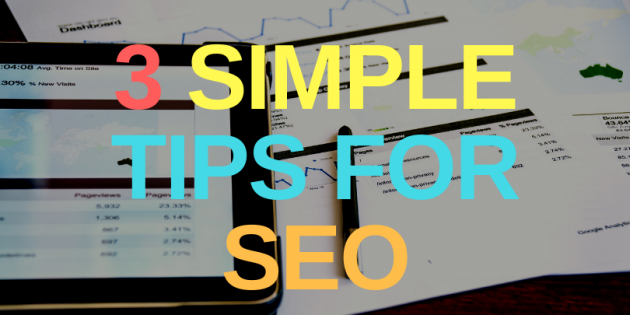 Linking whether its internal or external is useful in your website’s SEO. You need internal links for your current page to the blog in the other pages of your website. This is to specify what you are trying to say in your current page which is related to that in other page. External linking means that you add links to the external web pages or other social platforms. Make sure that you include your keywords in permalink. It is a URL used for your site. This serves as a guide to your specific blog you want people to see. It also good for your ranking process.